Washington (CNN) - President Barack Obama's personal popularity may be one reason he came out of what was arguably the worst week of his presidency with his approval rating holding steady, according to a new national poll. A CNN/ORC International survey, released Monday, also indicates that Americans see the current controversies as very important, maybe even as much as the Iran-Contra scandal, but they haven't reached the epic levels of Watergate. And the poll suggests the tea party movement has benefited from the Internal Revenue Service controversy, which involved the IRS targeting of tea party and other conservative groups who filed for tax exempt status, while the controversy over the administration's handling and response to last September's attack in Benghazi, which left the U.S. ambassador and three other Americans dead, does not appear to have affected the public's view of Hillary Clinton, who was U.S. secretary of state at the time of the attack. The week also included the revelation that the Justice Department had secretly subpoenaed telephone records for almost 20 Associated Press employees as part of a national security leak investigation. CNN reported on Sunday that 53% of people questioned in the survey said they approve of the job the president is doing, with 45% saying they disapprove. The president's approval rating was at 51% in CNN's previous poll, from early April. The two point rise was well within the survey's sampling error. 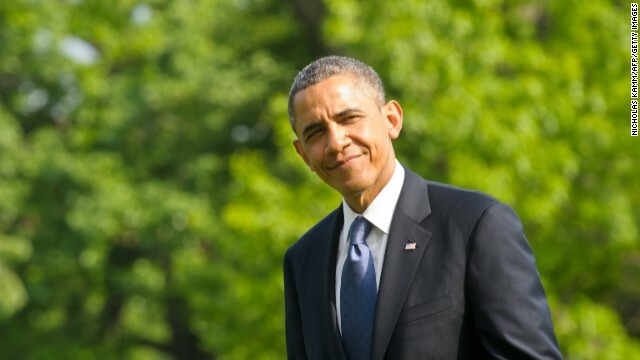 The new numbers indicate that Obama remains popular, with 79% of Americans saying the president is likable. "This underscores just how important the president's personal characteristics have been to him, and how useful it is to the White House that IRS, Benghazi, and AP controversies have not dimmed Obama's personal popularity so far," says CNN Polling Director Keating Holland. The president's handling of these matters so far may have helped boost his standing with the public on a couple of other key measures. Is the president a strong leader? "The last time the president reached that level was just after the death of Osama bin Laden in 2011," adds Holland. "That finding suggests that the public is responding favorably to Obama's stern reaction in recent days and hints that, far from catching blame for the latest controversies, Obama may actually be benefiting from them in some ways." The poll also indicates that 52% say the president can manage the government effectively. That's up 10 percentage points since the last time CNN asked the question, in 2011. Is the president honest and trustworthy? "That a number that has remained virtually unchanged for President Obama since 2009, and the underlying reason why most Americans say they believe what he has said about Benghazi and the IRS," says Holland. Not surprisingly, Democrats and Republicans are sharply divided in their views of Obama. Most independents view him as honest and trustworthy and as a strong leader, but they're split on whether he can govern effectively. As always, Obama's Achilles heel remains policy issues. Most Americans say they don't agree with him on the size and power of the federal government, and Americans remain split overall on whether they agree with Obama on issues they care about. So where do the current controversies rank compared to scandals that rocked Washington in the past? Fifty-five percent say the IRS and Benghazi matters are very important to the nation and 53% saying the same thing about the AP case. "But that doesn't quite make either of them another Watergate - at least, not yet. Nearly two-thirds say that Watergate was very important to the nation at the time; 58% say Iran-Contra was very important during the Reagan administration," says Holland. "So Americans see the current controversies as very important - maybe as much as Iran-Contra, but not yet at Watergate levels." Politically, the group that may have benefited the most from last week's developments is the tea party movement, which may be getting something akin to a "sympathy vote" for being targeted by the highly unpopular IRS. The tea party's overall favorable rating is up nine points, to 37%, since March. But a 45% plurality continue to hold an unfavorable view of the tea party movement. But views of the GOP have moved in the opposite direction. Fifty-nine percent of Americans have an unfavorable opinion of the Republican Party, tying the all-time record for negative views of the GOP. That's a five-point increase since March, and raises the possibility that the public approves of the GOP's actions on IRS and Benghazi but might be put off by the way the party has been making its point. Favorable ratings for the Democratic Party are up six points in that same time. And what about Hillary Clinton, who remains a target of some Republicans who claim the former secretary of state wasn't assigned enough blame in an independent probe into the Benghazi attack. According to the poll, 61% have a favorable impression of Clinton, who would instantly become the front-runner for the 2016 Democratic presidential nomination if she decides to run. Thirty-six percent see Clinton in an unfavorable light. The Clinton numbers are little changed from the 63%-33% favorable/unfavorable rating the last time CNN asked the question, in March. The poll was conducted by ORC International for CNN on May 17-18, with 923 adults nationwide questioned by telephone. The survey's sampling error is plus or minus three percentage points. This is a perfect example of the GOP bubble. They say anything and believe what they want, then they're surprised when educated Americans haven't been listening to their garbage all year. Eat crow republiCONs..
A CNN poll says that people who read CNN still like Obama? Umm... duh? The GOP is a failed party with failed economic, social, and international policies and they'll lose the voters and swing states again in 2016. What a joke. This is proof that a majority of Americans are victims of Stockholm Syndrome.